Developed in China, acupuncture is a 3,000-year-old system of medicine that is based upon principles of homeostasis and is commonly used for the treatment of pain and alleviation of symptoms. 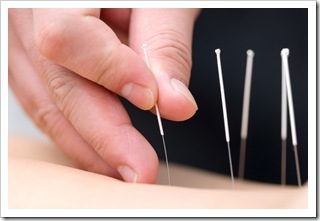 Acupuncture stimulates the body to produce its own pain relieving chemicals called “endorphins”. These chemicals mimic morphine by attaching to opiate receptor sites found throughout the nervous system. Endorphins help to block pathways that relay pain messages from the body to the brain, resulting in relief of pain, general relaxation and biochemical restoration of the body’s own internal regulation systems. According to traditional Chinese Medicine each human organ is associated with specific points in the skin. Invisible lines called meridians or channels link the points. The body’s natural energy or Qi (chi) flows through these channels. When disease or dysfunction occurs, acupuncturists know which points to manipulate to restore the natural flow of energy and to restore balance to the body’s systems. The improved energy and biochemical balance produced by acupuncture stimulates the body’s natural healing abilities, reducing inflammation, and promoting physical and emotional well-being. Safety is assured when Acupuncture is performed by a trained professional; such as a Traditional Chinese Medical practitioner. He or she will identify the precise location of acupuncture meridians, channels and points, correct angle, and depth of insertion. Disposable needles are used at all times, therefore there is no danger of cross-contamination or transmission of infectious diseases. Are there any adverse effects or risks to the treatment? One of the most striking aspects of acupuncture is the almost complete absence of adverse effects and complications from its use. Most patients find the treatment relaxing and experience minimal discomfort. People with pacemakers should avoid electrical stimulation unless approved by their cardiologist. Women in early pregnancy and hemophiliacs should be treated with caution. The AFCI recommends that only sterile disposable needles be used, preventing any risk of infection. In particular there is no possibility of transmission of the AIDS or hepatitis viruses when sterile disposable needles are used.